We are likely headed into the most active pattern of the year in terms of winter storms for the lower Midwest. 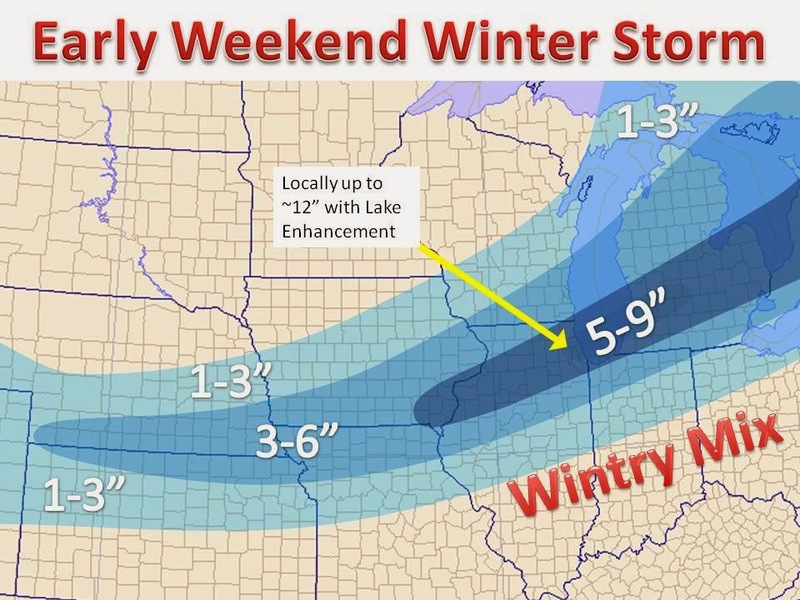 For starters, a winter storm will dump in excess of 6" across many areas by Saturday night. Prefrontal snows have already dumped ~5" of snow near the Nebraska and Kansas border and light snow has overspread northern Illinois. The main event and deformation zone get going later tonight with the heaviest snow on Saturday morning for northern Illinois to Lower Michigan. Some lake enhancement around the Chicago area can be expected. Anyone trapped under some of these enhanced bands have the potential to see a foot of snow by Saturday evening. Points further south will see a rain to wintery mix back to rain, icing will not be a major issue, but a coating of a tenth of an inch is possible. Track: Still up in the air, being 8-9 days out.